SEOUL, Oct. 12 (Yonhap) -- South Korea's trade minister will attend the ministerial meeting of the Regional Comprehensive Economic Partnership (RCEP) in Singapore to discuss ways to deepen economic ties with the fast-growing bloc, his office said Friday. Kim Hyun-chong will participate in the latest round of talks for RCEP -- a proposed mega trade deal involving Asian nations -- in Singapore on Saturday, the Ministry of Trade, Industry and Energy said. RCEP is in essence a massive regional trade deal between the 10 members of the Association of Southeast Asian Nations (ASEAN) and the six countries with which ASEAN has existing free trade agreements -- South Korea, China, Japan, India, Australia and New Zealand. 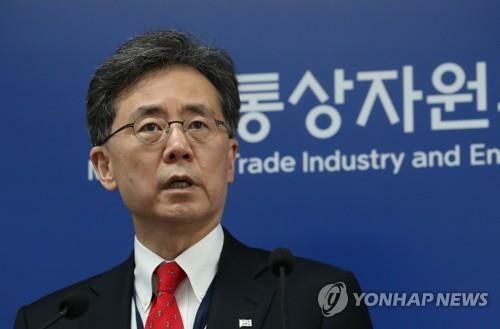 Seoul's point man on trade will explore ways to expand ties with the regional economic bloc by reaching an agreement on a trade deal by the end of the year, the ministry said. Asia's fourth-largest economy has sought stronger economic relations with Southeast Asian nations to reduce its heavy reliance on trade with the U.S. and China and foster new growth drivers. South Korea's exports to ASEAN members gained 5.9 percent on-year to US$48.93 billion in the first half of this year, making the regional economic bloc the nation's second-largest export market, according to the ministry's data.